Now that colder weather has arrived and preservation projects at our historic properties have slowed down, Historic New England’s carpentry crew is focused on shop work and planning for next year’s projects. This time of year allows a chance to reflect on the work accomplished during the recent building season. This is the fourth in a series of posts detailing recent carpentry projects that are essential in preserving Historic New England’s properties. If you imagine Historic New England’s collection of buildings as a library, the barnsthat inhabit the farm properties are the almanacs and how-to books, rather thanthe Gothic novels. They usually lack the exterior ornament, and the smoothplaster and intricate wallpaper of the homes. Whatthey feature in abundance is transparency. With no interior finishes, everydetail of the structure is plain to see. The stories of the buildings’construction and use, of traditionalbuilding transitioning to the new, faster techniques, of New England farmersadapting to changing markets, of prosperous beginnings and long hard use, are all easily read by anyone who looksclosely. A multi-faceted complex of structures thatcongregate around the house, built at widely different times for widelydifferent tasks, the barns at Cogswell’s Grantin Essex, Massachusetts, embody these broad regional themes. The barns create indoor and outdoor work spaces, and havesheltered animals, machines, and people for generations from the cold winds thatblow across the marshes of Essex. The Salt Hay Barn stands alittle apart from the house, facing the other barns across a broad lawn. On itsnortheast gable end stands a one-story ell with two broad double doors. Wheelswith wooden spokes and sagging rubber tires hang from nails over a small collectionof starter motors inside, hinting at the twentieth-century origin of the space,though the automobiles or tractors they belonged to are gone. 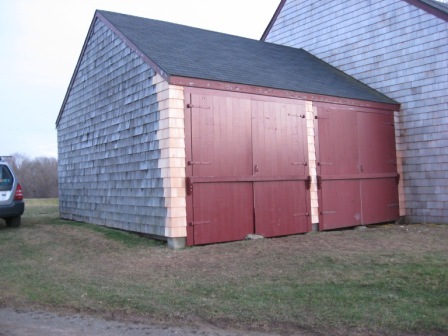 Last fall, Historic New England’s carpentry crew carefully copied and replaced one pair of these double doors. The originals were measured, photographed, and labeled before beingtransported to another barn for long-term storage. The new doors were made tomatch the old, copying the dimensions, design, and construction. A few smallchanges (paint on every surface, even the hidden ones, and the use of stainlesssteel screws instead of plain steel) were made to help withstand toughweather conditions. A small structuralrepair and some new trim and shingles readied the door frames. The hinges andother hardware were cleaned of rust and given a new coat of paint. Finally thedoors were hung, trimmed, and hung again. The raw edges were painted to keepwater at bay. Finally, a small copper tag stamped with a date and thewords “New Work” was attached to each new piece to make sure that the timeline remains clear when wind and weather have dulled the bright red paint andfaded the shingles to a silvery gray. View a photo gallery of the barn door project. Help Historic New England preserve our properties through projects like this with a gift to ourPreservation Maintenance Fund.